The IBM InfoPrint 4247-Z03 dot matrix printer handles up to 8 part forms. It’s a fast, tough printer. 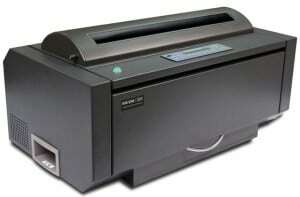 The IBM InfoPrint 4247-Z03 is a professional industrial impact matrix printer. It can print up to 1100 cps in Fast Draft mode. A rugged printer with metal covers, the IBM InfoPrint 4247-Z03 works great in harsh environments. Handles demanding applications easily. The IBM InfoPrint 4247-Z03 can have either one or two straight continuous-forms paper paths for outstanding paper-feeding reliability. One paper path is standard; the second path is an optional feature. The printer features new black covers, a full-size 2 line x 24 character 14 key operator panel, and a workload of up to 64,000 pages per month. Print-quality choices are Fast Draft mode, DP mode (DP), DP Text mode (DP Text), Near Letter Quality mode (NLQ), OCR-A, and OCR-B. Versatile paper-handling capability provides printing on up to 8-part carbonless forms.